This book draws on recent developments in research on Ferdinand de Saussure's general linguistics to challenge the structuralist doctrine associated with the posthumous Course in General Linguistics (1916) and to develop a new philosophical interpretation of Saussure's conception of language based solely on authentic source materials. This project follows two new editorial paradigms: 1. a critical re-examination of the 1916 Course in light of the relevant sources and 2. a reclamation of the historically authentic materials from Saussure's Nachlass, some of them recently discovered. In Stawarska's book, this editorial paradigm shift serves to expose the difficulties surrounding the official Saussurean doctrine with its sets of oppositional pairings: the signifier and the signified; la langue and la parole; synchrony and diachrony. The book therefore puts pressure not only on the validity of the posthumous editorial redaction of Saussure's course in general linguistics in the Course, but also on its structuralist and post-structuralist legacy within the works of Levi-Strauss, Lacan, and Derrida. Its constructive contribution consists in reclaiming the writings from Saussure's Nachlass in the service of a linguistic phenomenology, which intersects individual expression in the present with historically sedimented social conventions. 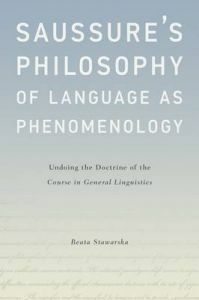 Stawarska develops such a conception of language by engaging Saussure's own reflections with relevant writings by Hegel, Husserl, Roman Jakobson, and Merleau-Ponty. Finally, she enriches her philosophical critique with a detailed historical account of the material and institutional processes that led to the ghostwriting and legitimizing the Course as official Saussurean doctrine. Beata Stawarska is Associate Professor of Philosophy at the University of Oregon. She is an author of Between You and I: Dialogical Phenomenology (Ohio UP, 2009) and a number of essays in contemporary European Philosophy. Recent recipient of the Humboldt Fellowship for Advanced Researchers, Stawarska is an expert in phenomenology, structuralism and post-structuralism.